And yesterday, and the day before! Yes indeed, this is a post about driving a CAR! Oh, the horror; right? Wrong, actually. I'm writing to state that I'm grateful for access to a vehicle that is powered by something other than myself. I've had a bit of a cough/runny nose/headache for the last month (off and on). Crap's going around, it seems. And with all of the reports of flu (of varying degrees) and even several cases of pneumonia, I've been trying to take care of myself. Plenty of mate, sleep, and rest (sorta). But of course as soon as I start to feel good enough to ride, I do, and then it's back to feeling crummy. With temperatures in the teens and twenties, this has proven to be a bad idea for my health. Breathing in the salty (thanks to the city's aggressive de-icing plan) frigid air isn't so good when you're already struggling in the respiratory happiness department. I've had so many arguments in my head about whether I should or shouldn't ride, but this week I've shut up all the chatter in my brain and just decided to drive every day until I don't feel that tickle in my throat. So, I'm happy to report that today, this fine Friday, I'm feeling a lot better. Not 100%, but pretty darn close. In fact, the above photo was snapped one day when I almost drove, but decided that I was TOO LAZY TO DRIVE! Because driving (on that particular cold frosty day) meant waiting for the car to warm up a bit (so the brakes un-freeze...I know, I know, not a great feature for a vehicle), scraping the windshield, and loading everything into it. On this day, I decided that riding was the better way to go, since I could just hop on and pedal. And I didn't feel thaaaaat sick. After the big snow storm a few weeks ago, I didn't even have to scrape the snow from our car. The big accumulation started on Wednesday and it wasn't until Sunday that (preparing for the shop's Festivus party) I had to drive anywhere. 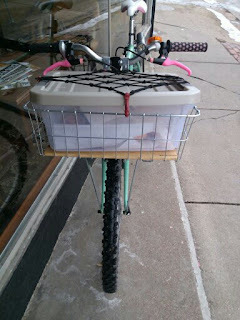 I was getting around pretty flawlessly on my bicycle; equipped with studded tires, fenders, rack and basket, I was set! I even helped push a few cars out of snowbanks, truly. Then Sunday, bloody Sunday. I was in the 4-Runner for approximately 2 minutes and got stuck on an icy hill!!!! Oh the irony!!!! Later Vince asked if I had it in 4 wheel drive...and no...I didn't know how to use it. So there I sat, wheels spinning, laughing in disbelief that the hill I had easily climbed on my dang bicycle the previous 4 days in a row, was too much for the Toyota. I slowly backed down in defeat. So funny, yet sad. Made me love my snow bike even more! And then parking!!! As you well know, I usually stop at Sweet Magnolia's on my way in to pick up baked goods for the day. 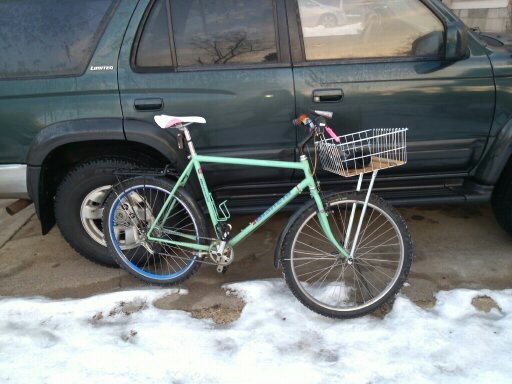 With my bike, I just park right up front, run in, load up, and pedal onward. However, with DRIVING...not so simple. Finding a parking spot close by, so I can run in and grab the goods proves nearly impossible given the popularity of both Sweet Mag's and the neighboring icon, Lisa's Radial Cafe. Sweet Mag's in my sweet basket! So yeah, riding is slower. This we know. However, depending on the perspective, way less of a hassle than driving. But for now, I'm on 4 wheels instead of 2 and grateful for that option. Have you all been enjoying the winter riding? I got really sick this week, too, and ended up driving on Monday, as I was feeling the impending doom approaching. And I was considering riding that day, mainly because the parking would be such a hassle. Then I didn't ride or drive for 3 days, as I hardly left my bed! Anyway, I think it's perfectly reasonable to make decisions based on common sense rather than principle. Sometimes, that means there's a big gray area. Ride (or drive) on, sister!